Pharrell Williams and Erin Wasson Join Rihanna’s 'Styled to Rock' Reality Show. 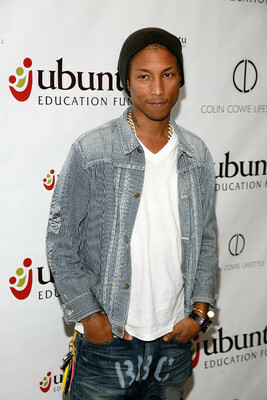 Pharrell Williams and Erin Wasson join Rihanna’s 'Styled to Rock' as mentors on the reality show. Well, the two are no strangers when it comes to the fashion world. Even though he is mostly known for his music career, Williams also has a few fashion lines including Billionaire Boys Club, Billionaire Girls Club, Bee Line and ICECREAM and has also designed jewelery and accessories for the legendary fashion house Louis Vuitton. “We are delighted to have Pharrell, who is a driving force in both the music industry and fashion world, serve as a mentor on Styled to Rock. Pharrell's unique aesthetic and commitment to individuality combined with Rihanna's vision for this series will enable our aspiring designers to hone their craft and learn from the very people who set the trends,” President of Style Media Salaam Coleman Smith said. Well, as for renowned model Erin Wasson, she has also turned fashion designer teaming up with cool french brand Zadig & Voltaire. Well, let's not forget to mention that Erin also designs jewelry for her label Low Luv. 'Styled to Rock' is a reality show based on the UK Sky Living original which featured Girls Aloud star Nicola Roberts, fashion designer Henry Holland and American celebrity stylist Lysa Cooper mentor the contestants. Rihanna is an executive producer on the show, which gives 12 up-and-coming designers the chance to create unique fashion pieces for a variety of celebrities.